Some may say that individuals with multiple tattoos and piercings—not to mention those indulging in the recent trends of branding, scarification and body implants—are ready and waiting for The Bomb. Need some fresh ink and a septum piercing to live out your Mad Max fantasies? Look no further than downtown's Black Rose Tattooers. 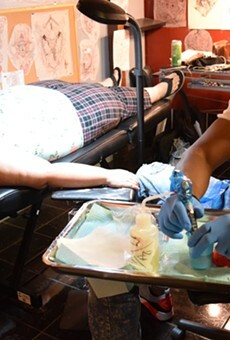 Servicing Tucson's body-ink aficionados for more than 15 years, Black Rose Tattooers' artists are the cream of the crop, the masters of their craft. Whether you want a full back piece or just a bumblebee on your ankle, they'll take the time to do it both beautifully and correctly.